Rachio is an exciting NEW company that is focused on managing water within the residential and light commercial market. Their first product, the Iro, is a Wi-FI based controller for underground sprinkler control. According to the EPA over 50% of residential irrigation water is wasted based on poor watering practices / systems. We also know in major US markets water is in tight supply or going up in price. This is surely a space where your customer is feeling some pain with their monthly watering bill. The Iro is a natural addition to a Control4 system. A brilliant approach to watering the lawn. 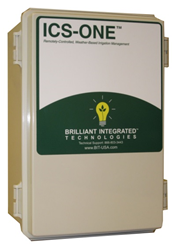 The ICS-ONE™ is a fully automatic, weather-based smart irrigation controller designed for residential and commercial applications that integrates with Control4. The ICS-ONE is unique in that it communicates nightly with a central server to receive water-saving commands, and then executes those commands in accordance with the customer’s preferred watering schedule. The central server determines the optimal watering time for each of the customer’s irrigation zones based on actual recent weather and its effects on the specific foliage, soil type and solar loading for that zone.